For a couple of weeks now, St John Street stalwart, The Well, has been throwing parties in their downstairs lounge on Wednesday nights. 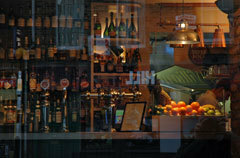 Show up on Wednesdays between 6.30pm and 7.30pm and your first cocktail, glass of wine or beer is free! There’s also free bar snacks too (nothing as delish as what’s on The Well’s upstairs menu but, hey, it’s free). A good mix of Clerkenwell scenesters, a DJ spinning funky (but not-terribly-obtrusive) house music and discounts on selected drinks throughout the night round out the excuses for going out midweek. And should you continue to carry on after the freebies, The Well is offering 25% off your food bill from their full a la carte menu (Monday-Friday).